Time for a bit of shameless nostalgia. Back in 1992 (that feels like a long time ago!) 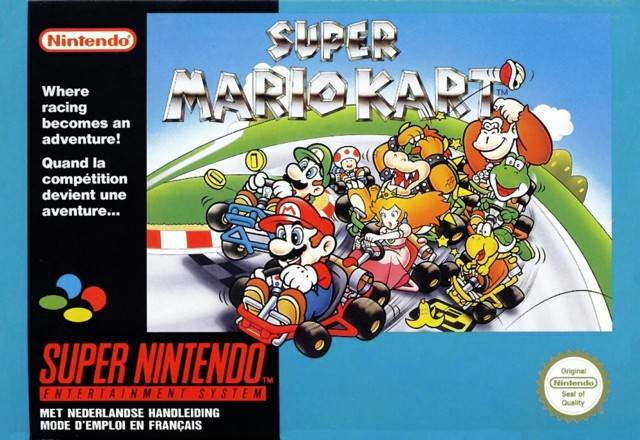 Nintendo released Super Mario Kart for the SNES, and a life-long love affair was born. By today’s standards Super Mario Kart is hardly amazing in terms of graphics or sound, but the true mark of any game is replay value, and to me, SMK still has this in spades! The first entry to the Mario Kart series introduced several staples to the series that remain to this day, such as turtle shells and other items designed to boost your race or impede someone else’s race. It was a lot of fun making my way around the various circuits, hurling heat-seeking red shells at racers ahead of me, or getting a jump feather at just the right time to hurl myself over an obstacle. The track design was clever and varied, with ghost houses, muddy chocolate tracks and lava-pocked fortresses. With various levels of difficulty (both in terms of available cups to compete for and the aggression of the AI) I can honestly say the original Super Mario Kart is still one of the best entries in the series, and one of the finest games ever made full stop. Another great thing about Mario Kart is that it’s two-player. No, it isn’t something you can play over wifi or anything so elaborate, but the two-player aspect of the game led to some great fun with my friends, as we fought hard to win championships. We enjoyed fighting it out, race after race, the margins between us often quite fine. SMK also had a ‘battle mode’, where two players could go head to head in arenas, battling to pop the other player’s balloons. Finally, there was a time trial mode, which is literally as it sounds. After so many new incarnations of Mario Kart, the original is still one of the best ones. It offered challenge, it offered fun, and it still offers replay value, even after so many years!